On Sept. 16, ex-president Jimmy Carter excoriated opponents of President Barack Obama as racists. "I think people who [attack] Obama have been influenced to a major degree by a belief that he should not be president because he happens to be African-American," Carter blathered. Obama's spokespeople quickly backed away from Carter's statements; Obama went so far as to remind David Letterman that he was black before the presidential election, and that the American public had elected him anyway. The fact is this: the American public is not racist. In fact, we're downright evenhanded -- we elect incompetents of all color to high office. We don't just elect Jimmy Carter president -- we elect the black Jimmy Carter, Barack Obama. Obama resembles Carter in virtually every way. Carter handed over the Panama Canal, built by the United States, to leftist dictator Omar Torrijos; Obama is currently in the process of handing over Honduras to leftist would-be dictator Manuel Zelaya, and he has already kowtowed to Venezuelan leftist dictator Hugo Chavez, Nicaraguan communist dictator Daniel Ortega and Cuban communist dictator Fidel Castro. Carter hated Israel, and along with his National Security Adviser Zbigniew Brzezinski, sought to undermine it; Obama, along with covert foreign policy adviser Zbigniew Brzezinski, hates Israel and seeks to undermine it. Brzezinski came out this week in favor of American forces shooting down Israeli jets headed to Iran to bomb their nuclear reactors. Obama used the Jewish holiday of Rosh Hashana as an opportunity to push Israel into concessions to Arab terrorists (his Ramadan message, by contrast, praised the contributions of Islam and pledged America's "unyielding" support for a Palestinian state). Carter surrendered Afghanistan to the Soviets; Obama is on the verge of surrendering Afghanistan to the Taliban. 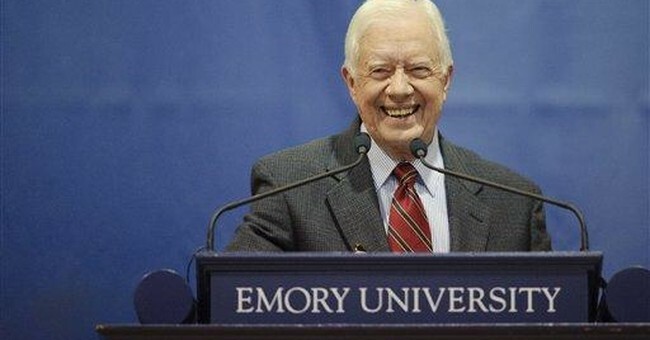 Carter pushed for nuclear disarmament. Under his administration, officials at the Arms Control and Disarmament Agency, the U.S. State Department and the White House met with leaders of the disarmament movement. He offered a personal endorsement for SANE, the nation's leading disarmament organization. Carter even cited a discussion with his 9-year-old daughter, Amy, about nuclear weaponry. Obama is no less committed to unilateral U.S. disarmament. He recently surrendered the missile defense shield over Eastern Europe, and he has repeatedly stated that his goal is a "world without nuclear weapons" -- a goal that demonstrates naivete bordering on the treasonous (Russia, China, Iran and North Korea will never disarm their weaponry or stop development without some form of coercion). Carter inflated the currency dramatically. Under Carter, the inflation rate started at 6.5 percent in 1977 and increased each year, ending at 13.5 percent in 1980. Under Obama, the nation's monetary supply (bank reserves and currency in circulation) has increased by over 100 percent since September 2008. Carter attempted to control private markets through price controls on gas, which naturally caused the famous gas station lines -- and he tried to levy price controls on medicine and other consumer prices, too. Obama has nationalized or heavily regulated key industries: the car industry, the student loan industry and much of the nation's key financial infrastructure. Carter wanted to impose a national health insurance system. His plan: regulated minimum health insurance paid for by businesses; public coverage for the poor and elderly; and a public option to sell coverage to the uncovered. Sound familiar? It should. Obama has been pushing a more extreme version of the Carter plan. Carter was a racist back in his day. Upon his return to Georgia after serving in the Navy, Carter joined the Sumter County School Board, where he supported segregation. He called his segregationist Lt. Gov. Lester Maddox "the essence of the Democratic Party." When Carter campaigned for governor, he labeled himself a "redneck" -- surely a code word in early 1970s Georgia. Obama, too, is a racist -- his spiritual mentor was Jeremiah "United States of KKKA" Wright, he surrounds himself with folks like Van "White People Pollute Black Communities" Jones, and he is married to Michelle "I've Never Been Proud of My Country" Obama. To be sure, there are many ways in which President Obama is even more extreme than Carter. Obama has used the National Endowment for the Arts (a federal agency) to push his re-election campaign; he has blackmailed private businesses in order to get them to support his proposals; he has threatened political opponents with "diversity" regulation in an attempt to shut them up. But in the largest sense, Obama and Carter bear striking and disturbing resemblances. We can only hope they bear one last resemblance: a one-term presidency.